McALLEN — When the criminal complaint filed against a local state district judge was unsealed weeks ago, many were surprised to find the case was filed in Houston — 350 miles away from where the alleged acts took place. Last week, an attorney for District Judge Rodolfo “Rudy” Delgado, who currently faces federal bribery charges, filed a motion for a venue change, claiming the government was attempting to gain an advantage by filing the case in Houston. “Defendant argues that the government intentionally filed the criminal complaint in Houston in an attempt to gain a tactical advantage over defendant’s rights to defend himself,” the court record states. But according to Gerald S. Reamey, a law professor at St. Mary’s University School of Law, an argument that the government is trying to gain an advantage by holding the case in Houston, although probably true, would not be reason enough for the court to grant the venue change. Reamey said arguing for a venue change is a tough standard to prove to the court. “In order to obtain a change of venue, the defendant is going to have to show in effect that he or she couldn’t get a fair trial wherever the government has filed the case,” the professor said. Angela Dodge, spokeswoman for the U.S. Attorney’s Office Southern District of Texas, said the decision on the location for federal cases is left up to the prosecution team. Prosecutors may choose any venue within the Southern District of Texas, which encompasses federal courthouses from Houston to Brownsville. Carlos A. Garcia, a board-certified attorney in criminal law, said he believes it’s telling that prosecutors filed the case away from the Rio Grande Valley. “If the government was so confident in the charges (they) have, (they) would have tried him (in McAllen),” Garcia said. Citing the criminal complaint, he said the venue is interesting since the government alleges Delgado took the bribes in the Valley. But Reamey said that although it is what typically happens — it isn’t required that prosecutors file where the allegations took place. “You could, for example, have a prosecutor decide that a particular federal prosecutor is particularly good at the kind of case you’re going to be trying, and that prosecutor is located in another office, and so they might want to file the case in another office,” the professor said. According to the motion filed last week, Delgado’s attorney, Adolfo “Al” Alvarez, makes the argument that because the government alleges the offenses took place in Hidalgo County, the case should be held in McAllen. 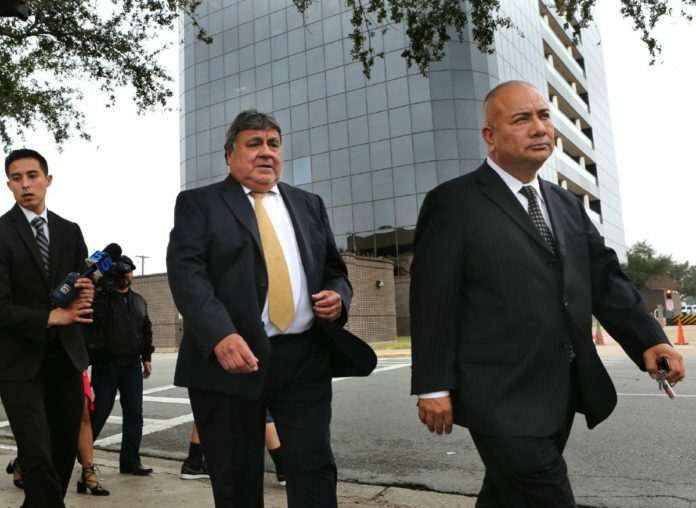 Federal prosecutors allege in the complaint that Delgado accepted bribes from at least one attorney — dubbed CHS, or confidential human source — in exchange for favorable consideration for his clients in Delgado’s court. This allegedly began in November 2016 until about late January 2018. The Mission-based attorney said this is what’s known as “forum shopping,” a tactic he said prosecutors employ to “tip the scale” in their favor during trials. Garcia points to state Sen. Carlos Uresti’s federal case as an example of a case held in the location where the allegations were made. But federal prosecutors moving cases from the Valley to other locations within the southern district is not new, or even out of the ordinary. Former Sheriff Brig Marmolejo’s 1994 bribery trial was held in Laredo, but the 2014 money laundering trial of former Sheriff Lupe Treviño was kept in McAllen. Garcia said Delgado, who is currently running unopposed in the March primary election as the Democratic candidate in the Place 4 seat on the 13th Court of Appeals, might be potentially dealing with a more conservative jury pool. Reamey said it’s likely prosecutors saw it as a disadvantage to hold the case in McAllen — where there’s more of a chance there would be jurors sympathetic to Delgado. Reamey, who has been a law professor at St. Mary’s for more than 35 years, said that’s why an argument that the government is trying to gain an advantage would not be enough to convince the court to grant the motion. Delgado, who was arrested Feb. 2 and made his initial appearance on Feb. 5, is expected to be indicted on the bribery charge sometime in early March. A decision on whether or not to grant a hearing on Delgado’s motion for a venue change has not been entered by the court. If convicted, Delgado faces up to 10 years in federal prison.